We’ve been Snack Attacked. We now live in a nation called Snackland, who’s Constitution guarantees the right to snack. Snacking is the new normal and there seems no way to turn the Mother Snack Ship around. There was a day when there was no such thing. Of course, there was a day we didn’t have smart phones either, you say, but who wants to go back there? No one it seems. Snacking has hijacked the nutritional landscape. We don’t even question if we should snack – the only question seems to be what we should snack. Snacking has increased over the last 30 years and become a $124 Billion industry. A 2010 study showed that many children snack as much as 6 times per day. SIX TIMES PER DAY! I know lots of kids that don’t even eat meals. They just snack all day. Parents complain that their kids aren’t hungry at meal time (surprise!) and they get worried – they would rather feed them snacks than have them starve. But is that really the choice? Snack or starve? Really? 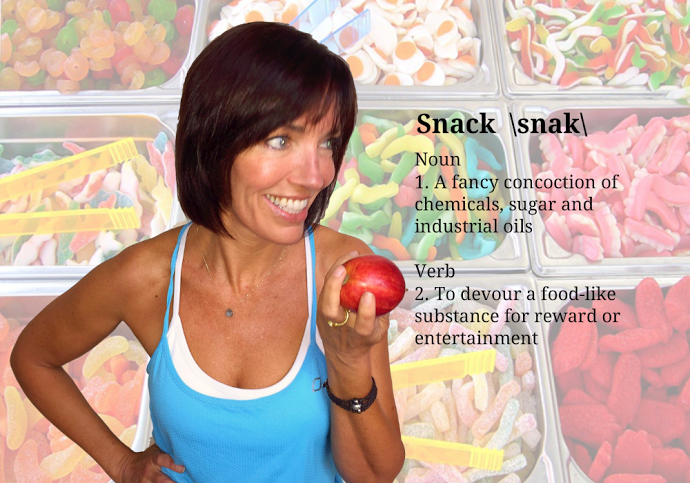 Snacks are used as rewards, distractions, and even regarded as key components of a “healthy” diet. No matter what age, snacks have become a part of our daily routines. When I was a kid, I didn’t ask my mom for a snack… it wasn’t part of the vernacular then. And even if I did ask for something to eat, the answer was, “No, you don’t want to spoil your dinner.” Am I the only one? Now snacks are an event. Snack Time is actually par with Bed Time. And I’m not just talking about for kids. Grabbing a snack has become a way of life due to busy lifestyles where on-the-go eating is routine. Some snack foods were originally created out of necessity. For instance, crackers were a snack developed as a staple for long sea voyages. Popcorn helped attract moviegoers, saving the movie theatre industry from collapsing during the Great Depression. However, the reasons for snacks have become far less legitimate. We’re bored. We’re lonely. We are looking for comfort. America’s favorite snack foods include chips, cookies, popcorn, bread, chocolate, and ice cream—all of which are processed and filled with sugar, sodium, and all kinds of additives. Snackland is addicted to convenience and sugar and corporations will happily crank out Twinkies and Fruit Roll-ups and “healthy” Granola Bars to satisfy the need. Unfortunately, the effects of grabbing one of these “snacks” can have dire consequences. So do we truly need to snack? The answer is no, not really. Our bodies are designed to go for long periods of time without food. When we snack all of the time, our body never gets the chance to digest completely, let alone burn body fat for fuel. Snacking makes it difficult to lose weight and stay healthy. Three meals a day that include a mixture of protein and fat are ideal and should keep you feeling satisfied. However, if you find yourself hungry between meals then it is okay to eat but remember, not all snacks are created equal. A snack is not a processed concoction of chemicals, sugar, and industrial oils. In fact, a snack shouldn’t stray too far from what you’re having for your meals. A great snack is a vegetable/fruit, protein, and healthy fat. To keep your body healthy and happy switch out those salty potato chips for an apple, some celery sticks with almond butter, or a few slices of turkey. It’s time to change the definition of “snacks” and start using them as fuel rather than rewards or entertainment. How often do you feel the need to snack? What are your favorite healthy snacks?